Boston, MA – February 16, 2017 – A new, state of the art education facility in the heart of Steung Meanchey’s most impoverished communities will open on February 16th, just 300 meters from where the notorious former Phnom Penh landfill site once stood. The Academy was fully funded and constructed by Velcro Companies for Cambodian Children’s Fund (CCF). The Neeson Cripps Academy (NCA) will provide high quality education through enhanced learning spaces and a focus on STEM education (Science, Technology, Engineering and Maths). The building was designed by COOKFOX Architects, a renowned firm responsible for landmark buildings such as the Bank of America headquarters. They have created a building which will offer an optimal learning space within an environmentally friendly, solar powered building. The five-story NCA will host 400 students, 30 teachers, 15 classrooms, 4 teacher workrooms, 2 international standard science labs, 2 computer labs, an art studio, a gallery space, a teacher training hub, e-learning facilities, a rooftop garden and a sports court. All are designed to work together to create a new generation of multi-skilled and fully rounded students. “I arrived here in 2004 with the simple aim of getting children off of the appalling Steung Meanchey garbage dump and into school,” says Scott Neeson, CCF’s Founder and Executive Director. “Today, with a solid, developed-world education program in place, and so many students moving into secondary school and high school, we need to ensure a smooth path to university and into careers that challenge our youth and meet the demands of Cambodia’s fast growing economy. We knew the need and potential and Velcro Companies and the Cripps family brought the vision to life: a state-of-the art STEM learning centre. After twelve tough years working here, the Neeson Cripps Academy is a remarkable gift. 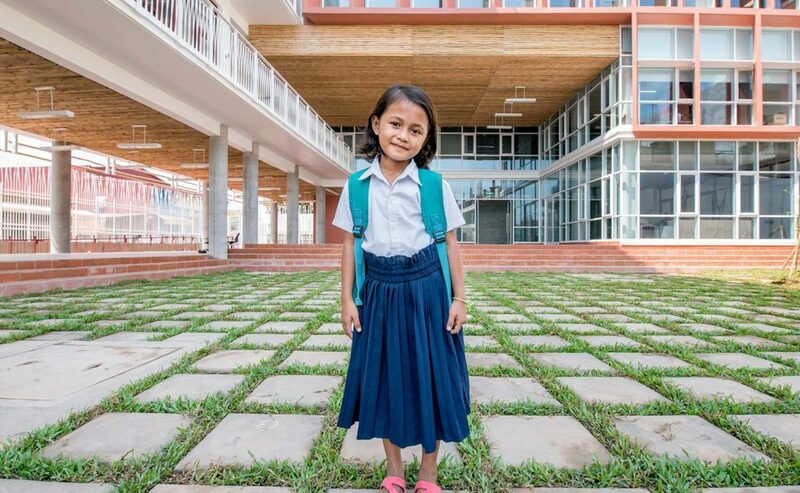 The poorest children in Cambodia can now access the best education. I can’t thank the Cripps family and Velcro Companies enough for their support of CCF and Cambodian education”. Velcro Companies is a technology-driven organization that provides solutions for businesses and consumers around the world, and is committed to advancing education and improving the lives of children across the globe. Cambodian Children’s Fund has spent the last 12 years developing acclaimed education and community programs designed to transform former garbage workers into the leaders of tomorrow. Cambodian Children’s Fund transforms the country’s most impoverished kids into tomorrow’s leaders by delivering education, family support and community development programs into the heart of Cambodia’s most impoverished communities. CCF was set up by Scott Neeson, who left his role as President of 20th Century Fox International to head Sony Pictures International’s marketing operations. After visiting the Steung Meanchey garbage dump in Phnom Penh in 2003, Neeson saw hundreds of children and their families living and working on one of the most toxic environments imaginable. Following this experience, Neeson founded Cambodian Children’s Fund. Today there are more than 2,000 students working towards a better future for themselves and their families through CCF’s award-winning education program. COOKFOX Architects is an an architectural studio dedicated to a vision of integrated, environmentally responsive design. We believe good design is sustainable and we are committed to being wise stewards of our shared natural and cultural resources. Guided by our passion for excellence, belief in the collaborative process, and persistent curiosity, COOKFOX pursues projects that allow us to fundamentally rethink how people interact with buildings and the natural environment.